Sunday and statutory holidays 7:00-11:00 PM. 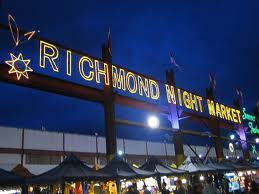 The Richmond Night Market is an exciting, fascinating event, and it makes you realize the huge Asian influence in Vancouver that locals take for granted. 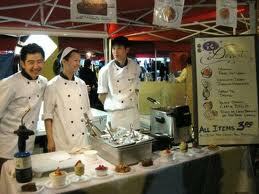 This multi-cultural event includes 80 food booths and over 200 retail vendors. Plan to have dinner since there is wonderful food from China, Korea, Japan, India and beyond. Along with live entertainment, you’ll find games, and this year, fresh produce and crafts. You can drive or take the Skytrain to the Bridgeport Station and walk 200 metres. This year’s market features vendors selling toys, belts, watches, scarves, fashion lenses for glasses, phone and computer accessories, clothes, bags, accessories, make up, nails and eye lash supplies, DVDs, hats, socks, jewelery, shoes, and housewares. Food includes Taiwanese Style shave ice, tofu pudding, yam fries, potato fries, onion rings, poutine, waffle cakes, sesame balls, dumplings, chicken, dry, deep fried or fresh squid. There are also prawn and octopus, dim sum, hurricane potatoes, chow mein, bbq duck wrap, roast corn, crepes, Japanese noodles, gyoza, fried fish and fried or boiled beef. You get the idea. There is a lot of food and a lot of variety. It’s best to take the Canada Line Skytrain to get here.